In true modern marketing ala “Apple”, Slate Digital has laid all the cards out on the table with a LOT of new products. One of them being the FG-Swiss, which is Slate’s Virtual Mix Rack module based on the Empirical Labs Distressor. 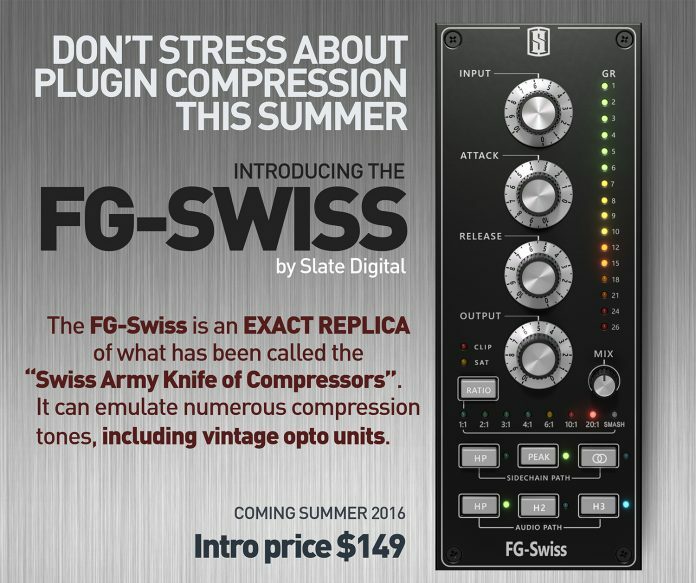 First and foremost I wanted to reveal the FG-SWISS, which is an exact replica of one of the most famous hardware compressors in the industry known for being a “Swiss Army Knife”. This compressor is like eight compressors in one! It is so versatile and can even sound like a vintage optical compressor! To say it has been difficult to replicate this compressor’s many sounds is quite the understatement! But Fabrice and our dev team have meticulously recreated its exact tone on every setting, and have included its precise nonlinear behaviors which help make it so musical! You’ll be using this guy in the summer, so stay tuned! You’re going to love it! !